The Channel Swap effect lets you take the image information from one channel and use it in another channel to achieve interesting effects. You can extract the following: red, green, blue, alpha values, hue, saturation, lightness, and luminance, as well as turn the information on or off. 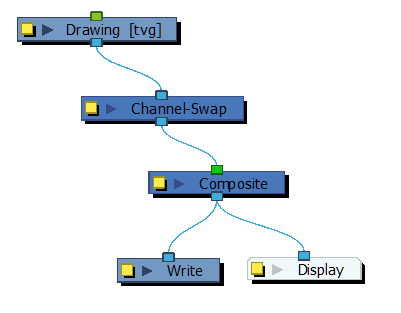 For detailed video tutorials and sample scenes by Adam Phillips, see toonboom.com/resources/video-tutorials/chapter/adam-phillips-harmony-effects. 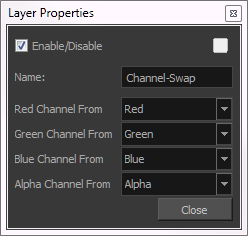 Red, Green, Blue, and Alpha Channel From Lets you select the image information to feed into the red, green, blue, and alpha channels. Full On sets all values to 255 and Full Off sets all values to 0.